RECIPE: DEEP FRIED WATERMELON - What About Watermelon? I’ve always held a special place in my heart (and stomach) for deep fried foods. I actually received a deep fryer as a gift a few years ago. I imagined cooking all sorts of things in it. French fries and chicken wings, of course, but also unusual things like ice cream and pickles and carnival legends like deep fried candy bars and deep fried pizza. My deep fried dreams never came true because I never used my fryer, but that’s about to change now that I’ve found this recipe for deep fried watermelon. Yes, deep fried watermelon. I haven’t tried it yet, but I will. And when I do, I’ll let you know how it turns out. Unless it’s not good. Then I’ll just put my fryer back in its box and never mention it again. If anyone makes this before I do, leave a comment with your feedback! Heat oil in a deep-fryer to 350 F. You can also use a wok if you don’t have a fryer. Whisk cornstarch with egg whites and water until combined. Dredge watermelon chunks in the flour, then coat with the cornstarch batter. Deep-fry in batches, leaving room in between pieces to properly brown, until watermelon chunks are golden. Remove from oil and drain well. Sprinkle deep-fried watermelon with a dusting of powdered confectioners’ sugar. Serve immediately while still crispy and hot. I’m just guessing here, but BE CAREFUL! 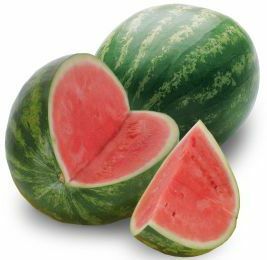 Because watermelon is 92 percent water, these little morsels of goodness might be very hot inside, so proceed with caution! I tried it at the county fair and they drizzled a bit of strawberry syrup on it after battering and frying the watermelon slice (with rind). It was really delicious! The melon was cooked on the outside and still juicy and crisp on the inside.